The site was occupied from at least the second century AD until the late third century. The early phase consisted of an enclosed settlement with timber stockade, possibly dating to the first century or first half of the second. Only a few sherds of pottery were associated with this phase, with a waxy feel and an oxidised exterior with a dark grey core. The vessel forms were unclear. This was replaced by a stone-built enclosure with a number of stone round-houses, which were probably in use by the second half of the second century and which continued until at least the late third century. The site is unusual as it produced more Roman pottery than Local Traditional (‘native’) ware. The fabric of the Local Traditional ware from this phase is not the same as that used in the earlier phase. The exact quantity recovered was not recorded, but the minimum number from the published account is approximately 14 sherds. As usual the most common form present was the plain-rimmed wide-mouthed vessels, but there were also a few everted-rimmed jars. There were 25 sherds of samian, 108 sherds of Roman coarse wares and 29 sherds from a single Dr 20 amphora. A sherd of late third century or later calcite-gritted ware was found under the tumble of the enclosure wall. 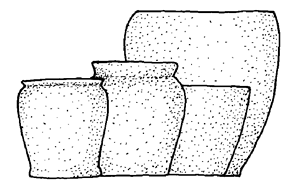 Most of the sherds came from jars used for cooking or storage, but there was also a flagon for holding liquids, a beaker for drinking, a narrow-mouthed jar for storage, bowls for serving or eating food and a mortarium for preparing food.